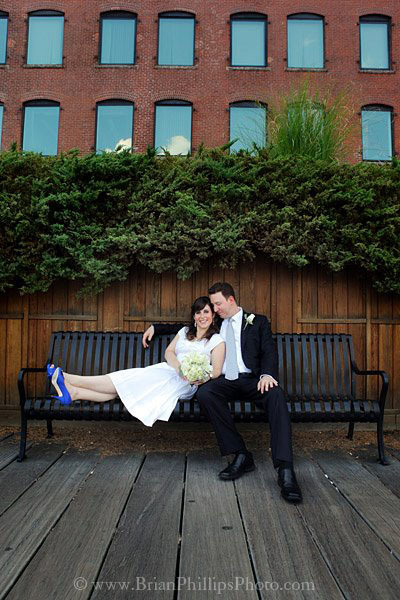 Minter and Scott Richter are the husband and wife duo of Minter & Richter Designs. With a love story that began over a decade after their first meeting, it might be the longest and shortest whirlwind romance in history. They’re the perfect couple to kick off our new series Better Together, spotlighting Etsy shop partnerships. Rings are just jewelry to some, but Minter and Scott see the people and love stories behind each of their wedding bands. Can you share your love story with us? Absolutely! I moved to Boston in 1987 when I was 17 to go to college. I happened into the 7-Eleven on Beacon Hill in Boston to apply for my first real job. Scott, 22 at the time, was already working there – his uncle owned the franchise. So, in essence, Scott was my first boss (“And your last!” is what he’d chime in here, har har). There was quite a group of us working there and we all ended up sharing an apartment and living the young Boston college life. Scott and I were not at all romantically entwined, but we were very good friends. For the 10 years that followed, we were completely apart growing and developing our own separate interests, which turned out to be key to being able to run the business today. Scott stayed in Boston and continued developing his skill as a craftsman; I moved around the United States and Europe developing an understanding of marketing and business. 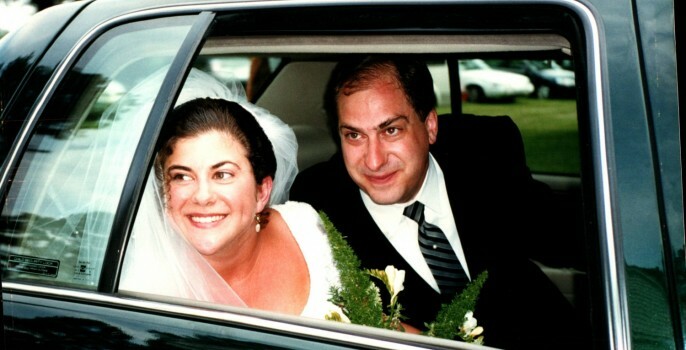 In August of 1998, after a decade of not seeing each other, we ran into each other once again on the Outer Banks of North Carolina – and bang! Three months later on November 10th, we were engaged to be married. It was definitely a whirlwind romance and I’m sure it seemed very sudden and out of the blue. We didn’t care and haven’t looked back since. What are you gonna do? Love is crazy like that. 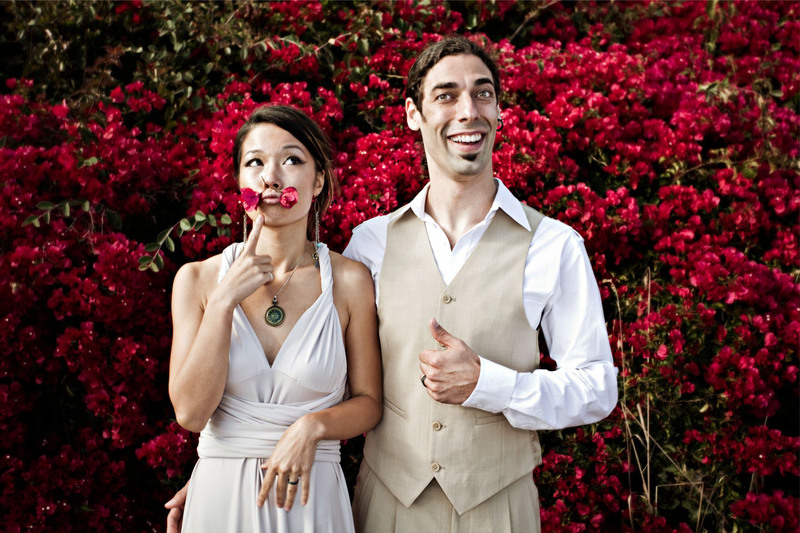 Has working with brides and grooms-to-be taught you anything about your own relationship? Working with brides and grooms-to-be is rewarding because they’re full of love and excitement for new beginnings – their happiness is downright contagious. When they invite us to play a small but significant part in their story by making their wedding rings, I delight in making them feel special and cared for. I offer personal attention to every step of the order. These rings may be small and delicate, but what they symbolize is so huge. With every ring we make, it’s a daily reminder to cherish and nourish the roots of our own love. 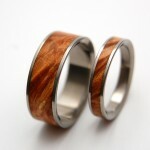 Did you start with titanium rings to be environmentally conscious? So many companies and products have jumped on the “green” bandwagon that it’s become a bit of an eco-blur for most consumers. We started with titanium because Scott knew it well from his knife design work. 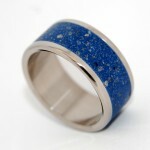 We thought that this super durable, shiny and beautiful metal would make great, quality rings. Educating our customers about titanium has been an important part of the business too, since titanium isn’t traditionally associated with romance. Luckily, the ecological conscience of many people today has been heightened and they’re no longer willing to blindly follow outdated marketing campaigns. We’re proud to be part of a new tradition of alternative jewelry metals that don’t fuel civil wars (diamond trade) or destroy ecosystems (gold mining). Our environmental and social conscience has evolved along with our business – realizing the timeliness and importance of our product. Scott has been making knives since he was about thirteen. He’s passionate about metalworking and machines – in fact, he keeps machinery manuals on his nightstand if you can believe it! He and partner Romas Banaitas gained early acclaim for their custom knife designs, but ultimately the time and labor required to produce knives couldn’t equate to a consistent income. We’ve certainly created other titanium products – pens, earrings, wine stops, etc. – but it was the ring designs that really caught peoples’ attention. Scott handmade our wedding bands, but it had never occurred to us that there might demand for something so untraditional. It quickly became apparent that this was a great business to be in; no matter what the economic or cultural climate, people will always be falling in love and want rings to show their commitment. So you could say that we fell into the ring business by accident. When and why did you start selling on Etsy? We began selling rings on Etsy in 2009. Etsy is a great place for any handmade entrepreneur to experiment with their burgeoning business. You get a virtually free platform to experiment and find out what sells, along with immediate exposure in the hippest handmade marketplace online. While we’re thrilled that our own website has flourished, we still love the sense of community and artistic enthusiasm on Etsy. What is the biggest benefit of being a husband and wife team? The biggest drawback? We’re each our own boss and each other’s bosses. Working for ourselves, we get to decide when we work and when we take a day off or spontaneous vacation. We’re grateful for the time it allows us to spend with our two boys. Of course it’s not fun and roses all of the time, because running a small business can easily take over your life. It can be hard to leave work at work, when work is at home. So we make each other laugh, and we’re a stronger team every time we can overcome an obstacle together. The greatest benefit is creating your own schedule, which allows us both to spend a huge amount of time with our two boys who are 10 and 8. Syrus and Ezra are both great budding ring designers themselves! Though they both strongly feel Glow in the Dark wedding bands is where we should be heading – though we aren’t so sure. Is there a specific item in your shop that you’re especially fond of? 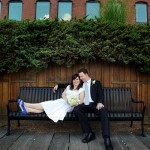 I’m in a very special position because I get to know almost all of our brides and grooms quite closely. During the design process I learn about their upcoming wedding, how they met, and their plans for their future together. The inlays they pick represent a certain aspect of their partner’s personality or appearance (like blue eyes or a love of surfing) – so it’s a very personal process. Our bands have a very special meaning to me because I remember the people for whom they were designed. 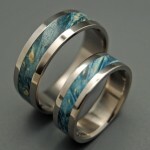 One of our most popular band sets is Starry Starry Night. When I look at that set, I remember this beautiful couple. She came up with the brilliant name “Starry Starry Night”! This band makes me remember the couple that inspired it, and how fabulous it was that she matched her shoes to his band. He named the band “Gotcha” and chose the color to match his favorite car. When I see the Comet and Constellation set, I remember the wonderful day we spent getting to know the couple better – they invited us to hand deliver the rings to their farm! We have a nice photo album to remember the occasion. There are so many other couples who I get to meet in person because they come into our Ring Room for consultations – like Adam and Bailey. We’re now HUGE fans of Adam’s music! Or Rachel and Karen who came all the way from Texas! 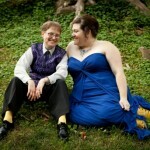 Or the fabulous couple who got married on a roller coaster! Or Shannon and Katie who so beautifully matched their wedding to their wedding rings! I can’t forget the fabulous family who designed their ring set to include their children, since they were both bringing children into the family. I love it when joining families do this. 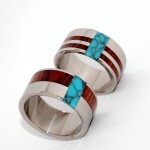 I love all of our rings and we get to work with some glorious materials. When other people look at our store, they see rings where I see people and love stories. I honestly count myself so incredibly lucky that I get to be such a tiny part of all these people’s evolving stories. That is my favorite part of it all. Do you have any special plans to celebrate Valentine’s Day? Our office assistant Lynn gave us a gift certificate to a lovely locavore-type restaurant here in Boston called Ten Tables; we’ve made a reservation to have a romantic dinner there. There are literally only ten tables in the restaurant, so it should be “packed” – but only as much as it can be! Minter & Richter Designs make awe-inspiring rings beautiful enough to match the love stories that go with them. Visit their website to see the full collection, or show your love by following them on Facebook or Twitter. Minter also has a Pinterest site full of great wedding ideas! 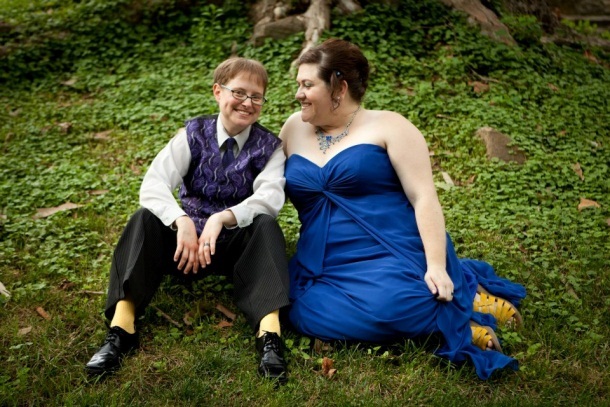 Thanks to Minter and Scott for sharing their inspiring story.